We know that teaching mindfulness in afterschool has great benefits for the young people as well as the staff who lead these activities. That is why we are expanding our efforts to help afterschool and summer programs incorporate mindfulness into their activities. Temescal Associates and the LIAS project are partnering with Inner Explorer to move this forward. Inner Explorer has answered the call for no/low cost resources through the end of May, 2016 that can sustain your efforts at bringing mindfulness to your afterschool program. These resources come in the form of daily audio sessions that are designed for different age groups and require only 20 minutes of staff training because staff learn with their students! These resources are no/low cost only if you sign up before May 31st, 2016 because Inner Explorer is in an expansion mode, Beta testing their new internet platform and hoping that once folks love the program, they will want to start an easy to use campaign to help pay it forward. Learn more here. 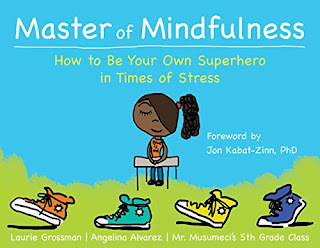 In addition, Laurie Grossman, a team member of Inner Explorer and Temescal Associates, and cofounder of Mindful Schools has published a children’s book entitled Master of Mindfulness: How To Be Your Own Superhero in Times of Stress. This book is authored and illustrated by 5th graders from Reach Academy in East Oakland, CA with Laurie and Angelina Alvarez. The majority of royalties from the sales of this book will be donated to a fund to support the post high-school educational or vocational endeavors of the twenty five authors who co-wrote the book. This book can be purchased at your local bookstore or through Amazon. You can also contact Temescal Associates for information on training to bring mindfulness to your staff (self-care strategies) and to your youth program. Temescal Associates is delighted about our partnership with Inner Explorer and we look forward to watching the fruits of this collaboration. The mission and vision of Inner Explorer are: To unlock the academic potential and foster well-being for millions of children through mindfulness and to break the cycle of poverty and violence. Inner Explorer was created in 2011 by Laura Bakosh and Janice Houlihan, who together have 30 years of experience practicing mindfulness. The K – 12 programs, based on Jon Kabat-Zinn’s Mindfulness Based Stress Reduction Program, were developed to help teachers and students develop a daily mindfulness practice. The effective, sustainable and scalable programs are streamed through the internet. It’s a simple push and play; staff and teachers learn with their students and there is no daily preparation. Research has shown the use of Inner Explorer results in a 50% reduction in discipline issues, a 43% reduction in teacher stress and a 10 – 30% increase in grades and test scores. 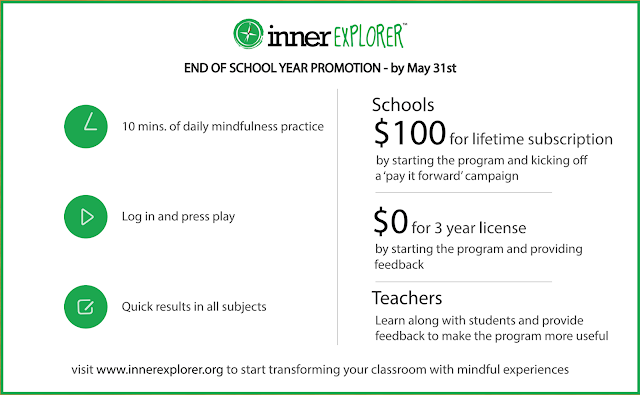 For questions about how to sign onto Inner Explorer, please go to www.innerexplorer.org or contact Laurie Grossman.